Generally speaking, a baby’s first word is “mama” or “papa/dada”, but when these words are first spoken they are merely babbles; your little one hasn’t learned yet to associate “dada” with dad or “mama” with mom. After babies learn to pronounce disyllables such as the examples above, you might hear them experiment with different sounds, and although none have true meaning just yet, they are preparing to communicate verbally. Some babies as early as 9 months begin to form word-like sounds, but if your little one is not there yet, be patient. Most children begin to speak words with meaning roughly around 11 to 16 months of age. It’s even considered normal for babies not to speak until 18 months of age. 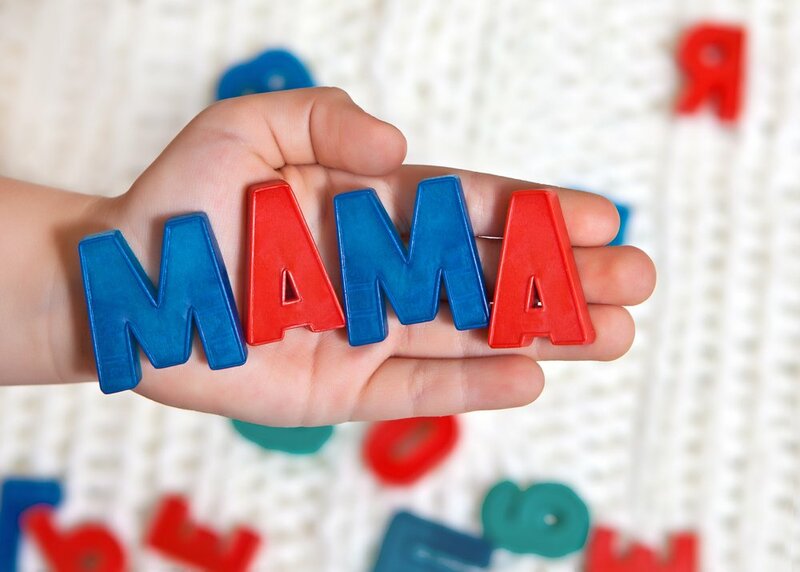 When they begin to pronounce words with meaning, “mama” or “dada” will actually mean “mom” or “dad” –such a sweet sound to a parent’s ear! Can I stimulate my baby’s language development? You sure can and it’s actually highly recommended! The more language a baby hears, the better she will be at acquiring and speaking lots of words. To speak, babies must develop their receptive language, meaning they are able to understand the meaning of a particular word. The best way to help your little one develop this type of language is by constantly speaking to her. So, talk with your baby all the time. Tell her what you are doing, narrate her actions, sing, read stories, ask questions, use funny voices, and respond to her and her cues with language. Also, remember to speak slowly and clearly, name every object and person instead of using pronouns, and use lots of repetition. If your baby is not speaking just yet, don’t worry! If at around 12 months of age your baby uses other forms of communication such as pointing at things or using gestures, she is doing great! These forms of communication are as valid as language and your little one is learning important social skills by doing so. Help her acquire language by clearly naming the object she points to. You can also expect your little one to begin saying “no” around 17-20 months of age. This might even become her favorite word! It’s completely normal. At 18 months of age, she might say other common words too, but remember that, even though your baby is learning to speak, her pronunciation will not be perfect. She might say “mil” instead of milk or “ba” for ball. This is quite normal and expected. With time, her linguistic skills will become refined and her words will be clear and complete. Next, at around 19 to 25 months of age she might speak approximately 50 words, say two word phrases, and comprehend up to 300 words! Keep reinforcing your little one’s language and in no time you’ll have a little chatterbox running around the house!